It’s funny what small things can make an ordinary week great! Aside from a smattering of rain (which caught us as we walked back from Spotlight on Saturday night–and okay, it’s pouring outside right now but I love it), the weather here has been beautiful and the days have been a real lark. There’s been quite a lot of baking going on, not to mention lazing around and generally being as sloth-like a creature as humanly possible–which, if you know my track record with stress and manic workaholicism, is nothing short of a miracle. On Wednesday, I decided to do a bit of impulse shopping and ended up walking out of Target with a big, beautiful woven Easter basket lined with yellow and pink cloth. Even better, I got to say “no” to the cashier who asked if I needed a bag–“nope! 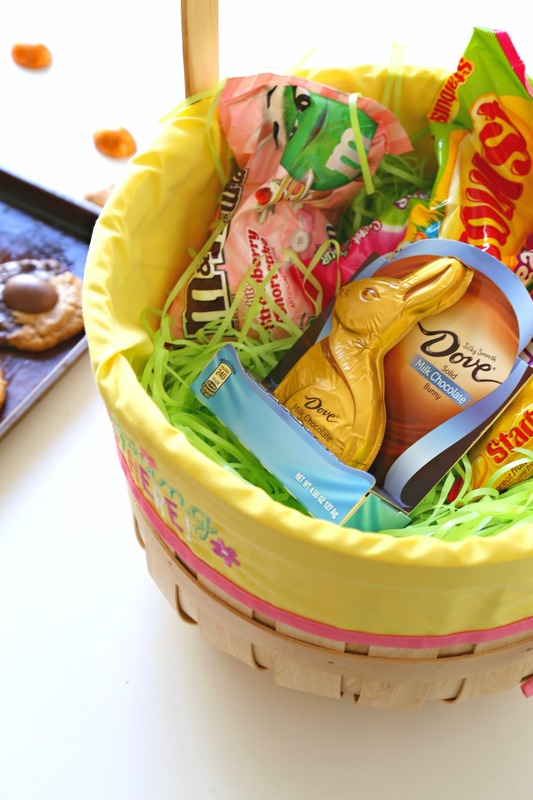 I’ve got a basket,” I informed him–and skipped out of the store carrying a basketful of Easter goodies, all the while feeling like Little Red Riding Hood on her way to her grandmother’s house. Word to the wise: if ever you need a pick-me-up for an otherwise gloomy day, try carrying a bright cheery basket! There’s nothing equal to it (well, except some chocolate and maybe these cookies, which I’ll get to in a sec). Oh, and then I grabbed a pack of Easter DOVE Peanut Butter Eggs because I freakin’ adore peanut butter and chocolate together. Like if kitten videos automatically make the world a better place, PB & chocolate are like the kitten videos of the edible world. Speaking of which, wanna know what else is pb & choco bliss…? These cookies, folks. Seriously dough (haha, get it? Because dough, though…nvm). 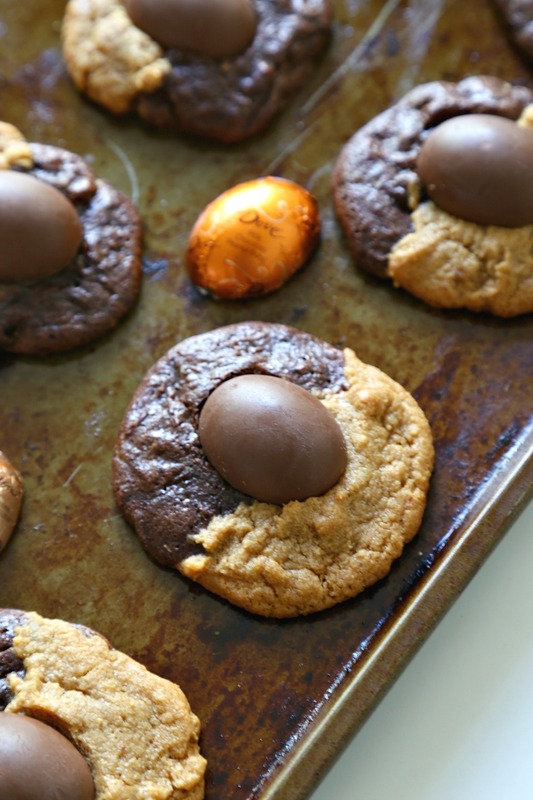 Inspired by the DOVE Peanut Butter Eggs that I bought, I decided to create the perfect Easter baked good: soft, rich Peanut Butter Chocolate Swirl Cookies with Easter PB Eggs pressed right on top after baking. The peanut butter cookie recipe is my FAVORITE by far, and so simple to whip together–just 4 ingredients! Did I mention that it’s also flourless? It’s based off of this recipe that I published a while back, and I totally recommend making it on its own even if you don’t have time to make the chocolate cookie dough. That being said…totally make the chocolate cookie dough. Trust me on this one! 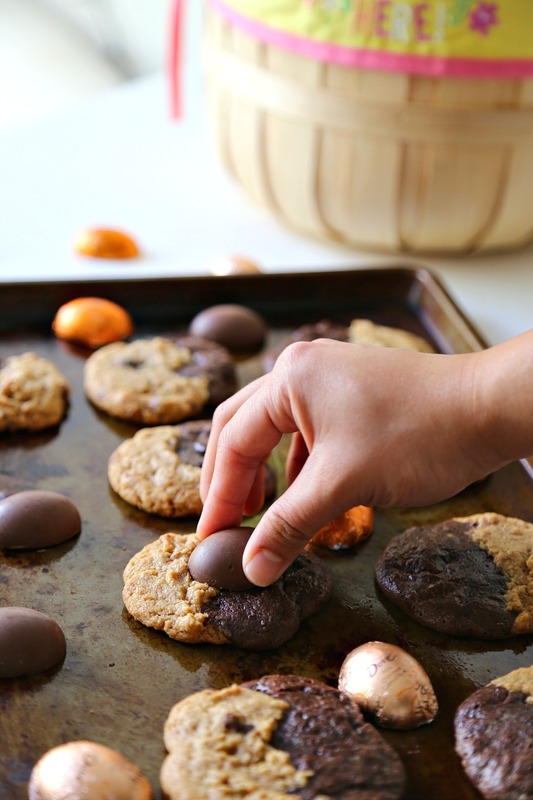 The chocolate half of the cookie is based on this super old recipe of mine but it’s so soft and so unbelievably filled with fudgy flavor that you’ll probably want to take the dough and smear it all over your face as a face mask before you’re finished. Resist this temptation (okay, maybe just a little) and continue to roll it together with the peanut butter dough before baking the two together for 8-10 minutes in your preheated oven. 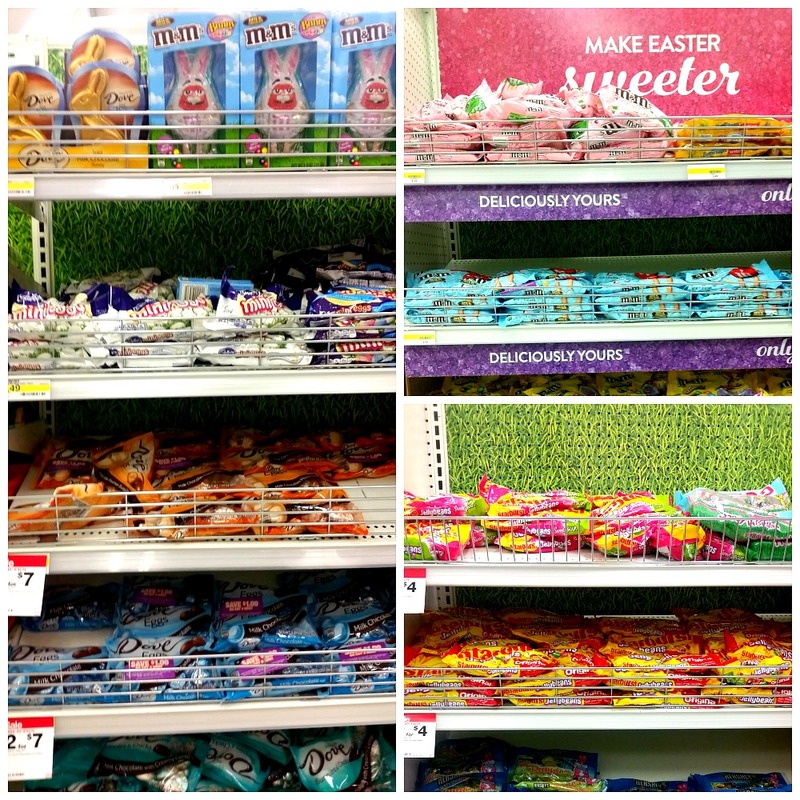 Maybe munch on a bit of that candy you bought while you wait…. …or, you know, you could just devour them all yourself. Happy baking and Easter-ing, folks! 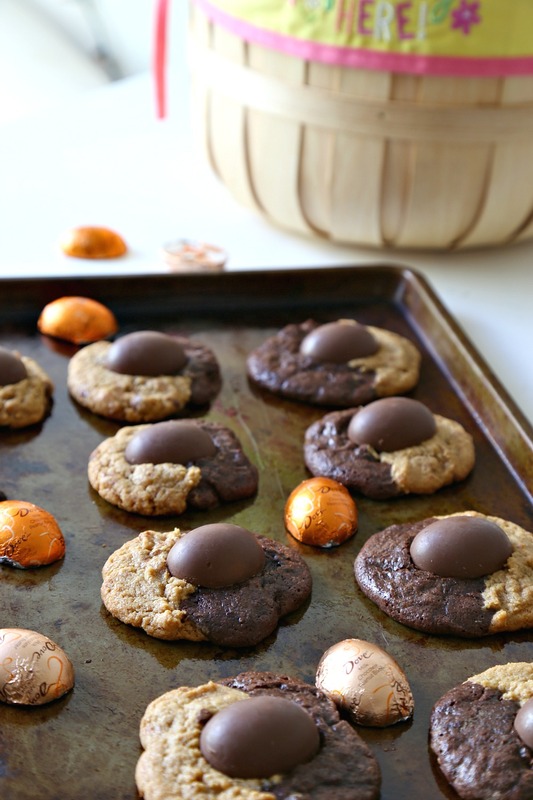 These peanut butter chocolate swirl cookies are the BEST way to celebrate Easter and any other occasion. 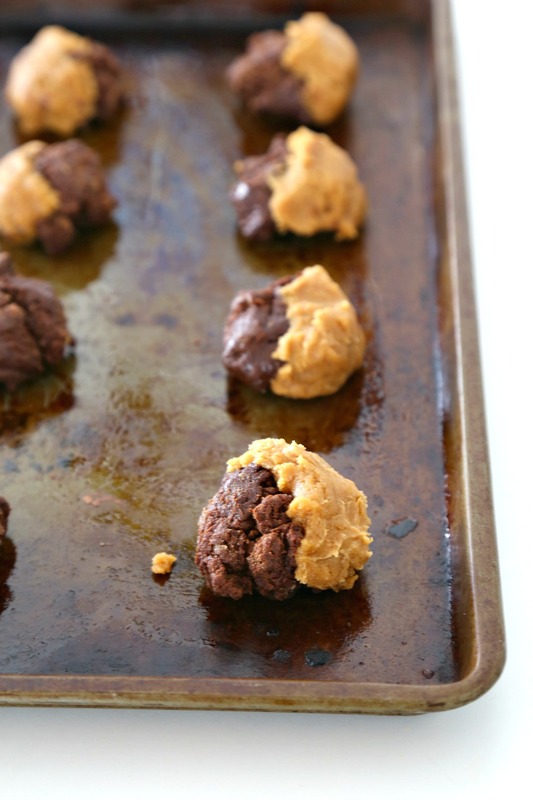 They're rich, soft, and filled with the perfect balance of PB & chocolate. 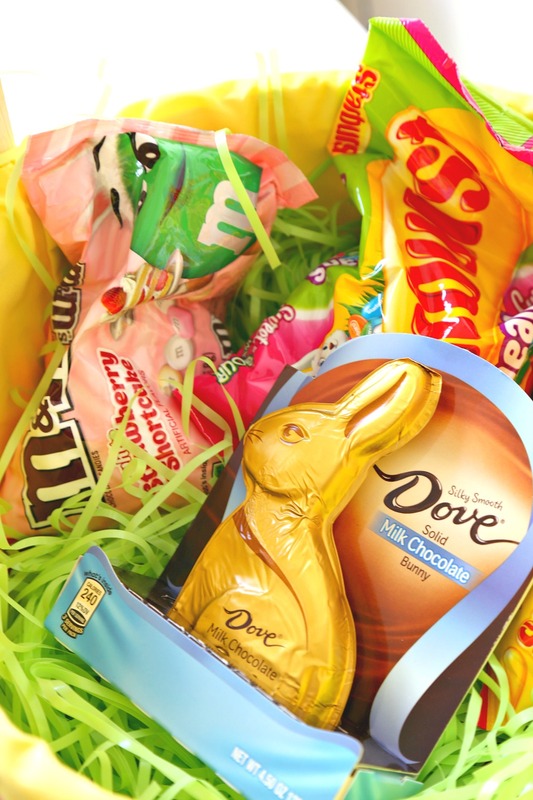 Press in a DOVE Peanut Butter Easter Egg on top for that final touch! In a large mixing bowl, cream together peanut butter and both sugars until smooth. Beat in egg and vanilla. Spoon out a tablespoon of the chilled chocolate cookie dough and a tablespoon of the peanut butter cookie dough (does not need to be chilled). Press together into a ball, half chocolate and half peanut butter. Place dough balls 2 inches apart on prepared cookie sheet. Bake in preheated oven for 9-11 minutes, until edges have set. Remove from oven and allow to cool for 10-15 minutes. 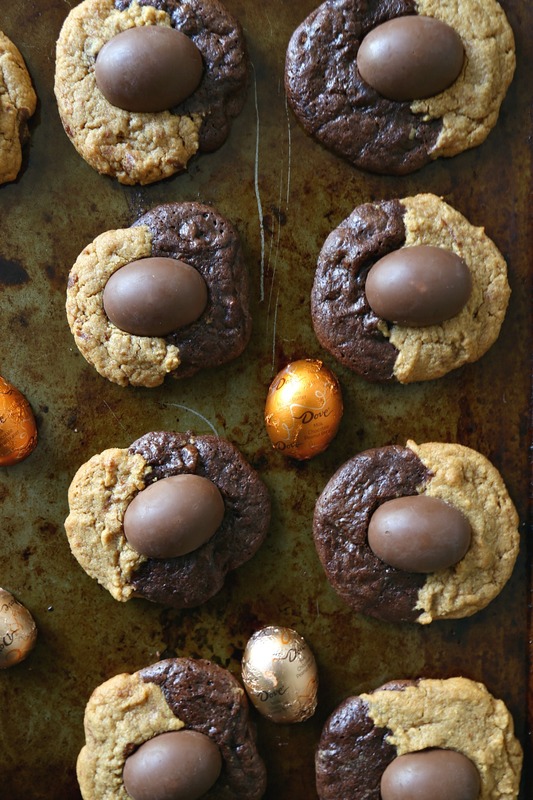 Press in one unwrapped DOVE Peanut Butter Easter Egg on top of each cookie and enjoy! I’m a sucker for peanut butter. And chocolate. One of the world’s best combos, don’t you think? These look marvelous — thanks. You are so sweet, Ala. And thank you for your sweet card. These cookies are too adorable and I love the combination of peanut butter and chocolate. So fun to make and share!